Information Commissioner’s Office, “Guide to the GDPR”, retrieved on 16th May 2018, licensed under the Open Government Licence. These pages sit alongside our Guide to the GDPR and provide more detailed guidance for UK organisations on Data Protection Impact Assessments (DPIAs) under the GDPR. They replace our previous code of practice on conducting privacy impact assessments. An effective DPIA helps you to identify and fix problems at an early stage, demonstrate compliance with your data protection obligations, meet individuals’ expectations of privacy and help avoid reputational damage which might otherwise occur. In some cases the GDPR says you must carry out a DPIA, but they can be a useful tool in other cases too. This guidance explains the principles and process that form the basis of a DPIA. It helps you to understand what a DPIA is for, when you need to carry one out, and how to go about it. It also explains the role of the ICO, when you have to consult them, and how that consultation process works. The process described in this guidance is designed to be flexible enough to work for organisations of any size and in any sector – although if you are processing for law enforcement purposes you should read this alongside the Guide to law enforcement processing. If you are likely to conduct regular DPIAs, you can also use this guidance as a starting point to develop your own bespoke DPIA process and methodology which fits with your particular needs and existing working practices. For an introduction to the key themes and provisions of the GDPR, including broader accountability obligations, you should refer back to the Guide to the GDPR. You can navigate back to the Overview at any time using the link on the top of this page. Links to other relevant guidance and sources of further information are also provided throughout. Yes, the GDPR includes a new obligation to conduct a DPIA for types of processing likely to result in a high risk to individuals’ interests. This is part of the new focus on accountability and being able to demonstrate that you comply with the GDPR. It is a key element of data protection by design and by default, and also reflects the more risk-based approach to data protection obligations taken throughout the GDPR. What should we do if we already carry out PIAs? Privacy impact assessments (PIAs) have been used for many years as a good practice measure to identify and minimise privacy risks associated with new projects. DPIAs are very similar to PIAs, so if you already carry out PIAs in accordance with our PIA code under DPA 1998, the new process will be very familiar. DPIAs are mandatory for any processing likely to result in a high risk (including some specified types of processing). You need to review your screening questions to make sure you comply with the new requirements. You must seek the advice of your data protection officer (DPO), if you have one. You should also seek the views of people whose data you intend to process, or their representatives, where appropriate. If after doing a DPIA you conclude that there is a high risk and you cannot mitigate that risk, you must formally consult the ICO before you can start the processing. What should we do if we don’t already carry out PIA’s? If you don’t have an existing PIA process, you need to ensure that you understand DPIA requirements and embed them into your business practices. If you are likely to carry out lots of DPIAs, you may want to consider using this guidance as a starting point to design a bespoke DPIA process to meet your specific needs and fit with your existing organisational practices. You should also review your existing processing operations to identify whether you already do anything that would be considered likely high risk under the GDPR. If so, are you confident that you have already adequately assessed and mitigated the risks of that project? If not, you may need to conduct a DPIA now to ensure the processing complies with the GDPR. However, the ICO does not expect you to do a new DPIA for existing processing where you have already considered relevant risks and safeguards (whether as part of a PIA or another formal or informal risk assessment process) - unless there has been a significant change to the nature, scope, context or purposes of the processing since that previous assessment. We recommend that you document your review and your reasons for not conducting a new DPIA where relevant, to help you demonstrate compliance if challenged. The working party has adopted Guidelines on Data Protection Impact Assessment (DPIA) and determining whether processing is “likely to result in a high risk” for the purposes of Regulation 2016/679 (WP248). In particular, Annex 2 sets out a detailed checklist for DPIA methodology. A DPIA is a process designed to help you systematically analyse, identify and minimise the data protection risks of a project or plan. It is a key part of your accountability obligations under the GDPR, and when done properly helps you assess and demonstrate how you comply with all of your data protection obligations. It does not have to eradicate all risk, but should help you minimise and determine whether or not the level of risk is acceptable in the circumstances, taking into account the benefits of what you want to achieve. DPIAs are designed to be a flexible and scalable tool that you can apply to a wide range of sectors and projects. Conducting a DPIA does not have to be complex or time-consuming in every case, but there must be a level of rigour in proportion to the privacy risks arising. There is no definitive DPIA template that you must follow. You can use ICO's suggested template if you wish, or you may want to develop your own template and process to suit your particular needs, using this guidance as a starting point. DPIAs are an essential part of your accountability obligations. Conducting a DPIA is a legal requirement for any type of processing, including certain specified types of processing, that are likely to result in a high risk to the rights and freedoms of individuals. Failing to carry out a DPIA in these cases may leave you open to enforcement action, including a fine of up to €10 million, or 2% global annual turnover if higher. Considering the risks related to your intended processing before you begin also supports compliance with another general obligation under GDPR; the requirement for data protection by design and default. In general, consistent use of DPIAs increases the awareness of privacy and data protection issues within your organisation. It also ensures that all relevant staff involved in designing projects think about privacy at the early stages and adopt a ‘data protection by design’ approach. A DPIA also brings broader compliance benefits, as it can be an effective way to assess and demonstrate your compliance with all data protection principles and obligations. However, DPIAs are not just a compliance exercise. An effective DPIA allows you to identify and fix problems at an early stage, bringing broader benefits for both individuals and your organisation. In turn, this can create potential benefits for your reputation and relationships with individuals. Conducting a DPIA can help you to build trust and engagement with the people using your services, and improve your understanding of their needs, concerns and expectations. There can also be financial benefits. Identifying a problem early on generally means a simpler and less costly solution, as well as avoiding potential reputational damage later on. A DPIA can also reduce the ongoing costs of a project by minimising the amount of information you collect where possible, and devising more straightforward processes for staff. A DPIA can cover a single processing operation, or a group of similar processing operations. You may even be able to rely on an existing DPIA if it covered a similar processing operation with similar risks. A group of controllers can also do a joint DPIA for a group project or industry-wide initiative. For new technologies, you may be able to use a DPIA done by the product developer to inform your own DPIA on your implementation plans. You can use an effective DPIA throughout the development and implementation of a project or proposal, embedded into existing project management or other organisational processes. For new projects, DPIAs are a vital part of data protection by design. They build in data protection compliance at an early stage, when there is most scope for influencing how the proposal is developed and implemented. In other words, a DPIA is not simply a rubber stamp or a technicality as part of a sign-off process. It’s vital to integrate the outcomes of your DPIA back into your project plan. You should not view a DPIA as a one-off exercise to file away. A DPIA is a ‘living’ process to help you manage and review the risks of the processing and the measures you’ve put in place on an ongoing basis. You need to keep it under review and reassess if anything changes. In particular, if you make any significant changes to how or why you process personal data, or to the amount of data you collect, you need to show that your DPIA assesses any new risks. An external change to the wider context of the processing should also prompt you to review your DPIA. For example, if a new security flaw is identified, new technology is made available, or a new public concern is raised over the type of processing you do or the vulnerability of a particular group of data subjects. The working party has adopted Guidelines on Data Protection Impact Assessment (DPIA) and determining whether processing is “likely to result in a high risk” for the purposes of Regulation 2016/679 (WP248). There is no explicit definition of ‘risk’ in the GDPR, but the various provisions on DPIAs make clear that this is about the risks to individuals’ interests. Article 35 says that a DPIA must consider “risks to the rights and freedoms of natural persons”. This includes risks to privacy and data protection rights, but also effects on other fundamental rights and interests. The focus is therefore on any potential harm to individuals. However, the risk-based approach is not just about actual damage and should also look at the possibility for more intangible harm. It includes any “significant economic or social disadvantage”. The impact on society as a whole may also be a relevant risk factor. For example, it may be a significant risk if your intended processing leads to a loss of public trust. A DPIA must assess the level of risk, and in particular whether it is ‘high risk’. The GDPR is clear that assessing the level of risk involves looking at both the likelihood and the severity of the potential harm. For more guidance on what this all means in practice, see the section on how to carry out a DPIA. The working party has adopted Guidelines on Data Protection Impact Assessment (DPIA) and determining whether processing is “likely to result in a high risk” for the purposes of Regulation 2016/679 (WP248) which include some discussion of the nature of risk. See also the working party’s Statement on the role of a risk-based approach in data protection legal frameworks (WP218, 30 May 2014). Risk in this context is about the potential for any significant physical, material or non-material harm to individuals. See 'What is a DPIA?' for more information on the nature of the risk. To assess whether something is ‘high risk’, the GDPR is clear that you need to consider both the likelihood and severity of any potential harm to individuals. ‘Risk’ implies a more than remote chance of some harm. ‘High risk’ implies a higher threshold, either because the harm is more likely, or because the potential harm is more severe, or a combination of the two. Assessing the likelihood of risk in that sense is part of the job of a DPIA. However, the question for these initial screening purposes is whether the processing is of a type likely to result in a high risk. What does ‘likely to result in a high risk’ mean? The GDPR doesn’t define ‘likely to result in high risk’. However, the important point here is not whether the processing is actually high risk or likely to result in harm – that is the job of the DPIA itself to assess in detail. Instead, the question is a more high-level screening test: are there features which point to the potential for high risk? You are screening for any red flags which indicate that you need to do a DPIA to look at the risk (including the likelihood and severity of potential harm) in more detail. Article 35(3) lists three examples of types of processing that automatically requires a DPIA, and the ICO has published a list under Article 35(4) setting out ten more. There are also European guidelines with some criteria to help you identify other likely high risk processing. This does not mean that these types of processing are always high risk, or are always likely to cause harm – just that there is a reasonable chance they may be high risk and so a DPIA is required to assess the level of risk in more detail. If your intended processing is not described under GDPR, Article 35(3) the ICO list or European guidelines then ultimately, it’s up to you to decide whether your processing is of a type likely to result in high risk, taking into account the nature, scope, context and purposes of the processing. If in any doubt, we would always recommend that you do a DPIA to ensure compliance and encourage best practice. New technologies: processing involving the use of new technologies, or the novel application of existing technologies (including AI). Denial of service: Decisions about an individual’s access to a product, service, opportunity or benefit which is based to any extent on automated decision-making (including profiling) or involves the processing of special category data. Large-scale profiling: any profiling of individuals on a large scale. Biometrics: any processing of biometric data. Genetic data: any processing of genetic data, other than that processed by an individual GP or health professional for the provision of health care direct to the data subject. Data matching: combining, comparing or matching personal data obtained from multiple sources. Invisible processing: processing of personal data that has not been obtained direct from the data subject in circumstances where the controller considers that compliance with Article 14 would prove impossible or involve disproportionate effort. Tracking: processing which involves tracking an individual’s geolocation or behaviour, including but not limited to the online environment. Targeting of children or other vulnerable individuals: The use of the personal data of children or other vulnerable individuals for marketing purposes, profiling or other automated decision-making, or if you intend to offer online services directly to children. Risk of physical harm: Where the processing is of such a nature that a personal data breach could jeopardise the [physical] health or safety of individuals. You should also be aware that the data protection authorities in other EU member states will publish lists of the types of processing that require a DPIA in their jurisdiction. For practical examples of operations which require a DPIA, read our list of processing operations ‘likely to result in high risk’. Automated decision-making with legal or similar significant effect. Data processed on a large scale. Data concerning vulnerable data subjects. Innovative use or applying new technological or organisational solutions. Preventing data subjects from exercising a right or using a service or contract. In most cases, a combination of two of these factors indicates the need for a DPIA. However, this is not a strict rule. You may be able to justify a decision not to carry out a DPIA if you are confident that the processing is nevertheless unlikely to result in a high risk, but you should document your reasons. On the other hand, in some cases you may need to do a DPIA if only one factor is present – and it is good practice to do so. For more guidance on these factors, read the Article 29 guidelines. What does ‘new technologies’ mean? The GDPR does not define ‘new technologies’. Recital 91 indicates that this concerns new developments to the state of technological knowledge in the world at large, rather than technology that is new to you. Using technology to process personal data in novel or unexpected ways is likely to be inherently more risky than using technologies that are tried and tested, as the practical implications will not yet be fully understood. This could include the application of artificial intelligence or machine learning within processing operations. The Article 29 working party guidelines also suggest that the concept of new technologies includes the innovative application of existing technologies to process data in new ways or for new purposes. Read ICO's paper on paper on big data, artificial intelligence, machine learning and data protection which contains further guidance on application of these technologies in a data protection context. Again, the GDPR does not define ‘systematic’ or ‘systematic and extensive’. is carried out as part of a strategy. The term ‘extensive’ implies that the processing also covers a large area, involves a wide range of data or affects a large number of individuals. The Article 29 working party of European data protection authorities has adopted Guidelines on Data Protection Officers (‘DPOs’) (WP243) which contain guidance on the meaning of the term ‘systematic’. The GDPR does not define the concept of a legal or similarly significant effect. However, Article 29 working party guidelines on this phrase in the context of profiling provisions give some further guidance. In short, it is something that has a noticeable impact on an individual and can affect their circumstances, behaviour or choices in a significant way. A legal effect is something that affects a person’s legal status or legal rights. A similarly significant effect might include something that affects a person’s financial status, health, reputation, access to services or other economic or social opportunities. Read our guidance on profiling and automated decision-making for more on legal and similarly significant effects. Read our guidance on children and the GDPR guidance on children and the GDPR for more on significant effects specifically in relation to children and their personal data. The Article 29 working party of European data protection authorities has adopted Guidelines on automated individual decision-making and profiling for the purposes of Regulation 2016/679 (WP251) which contain guidance on legal and similarly significant effects. the geographical extent of the processing. a telephone or internet service provider processing user data. Individual professionals processing patient or client data are not processing on a large scale. a data protection risk assessment was carried out as part of the impact assessment when the legislation was adopted. This may not always be clear, and in the absence of any clear and authoritative statement on whether such an assessment was conducted we recommend that you err on the side of caution and conduct a DPIA to ensure you consider how best to mitigate any high risk. You have already done a substantially similar DPIA. You need to be confident that you can demonstrate that the nature, scope, context and purposes of the processing are all similar. The ICO issues a list of processing operations which do not require a DPIA. We have the power to establish this type of list, but we have not done so yet. We may consider a list in future in the light of our experience of how the DPIA provisions are being interpreted in practice. You should consult with individuals and other stakeholders as needed throughout this process. The DPIA process is designed to be flexible and scalable. You can design a process that fits with your existing approach to managing risks and projects, as long as it contains these key elements. You can also scale the time and resources needed for a DPIA to fit the nature of the project. It does not need to be a time-consuming process in every case. Annex 2 of WP29 Guidelines on Data Protection Impact Assessment (DPIA) and determining whether processing is “likely to result in a high risk” for the purposes of Regulation 2016/679 (WP248) sets out a checklist of criteria for an acceptable DPIA. You can use or adapt ICO's sample DPIA template if you wish. You don’t have to use this template. You can develop your own template to suit your own needs, or use existing project management methodology, as long as it covers all of the key elements of the process. If you are developing your own template, you might find it helpful to refer to the Criteria for an acceptable DPIA in Annex 2 of the Article 29 working party guidelines. Who is responsible for the DPIA? You can decide who has responsibility for carrying out DPIAs within your organisation, and who signs them off. You can outsource your DPIA, but you remain responsible for it. If you have a DPO, you are required to ask for their advice on your DPIA, and document it as part of the process. You may want to ask a processor to carry out a DPIA on your behalf if they undertake the relevant processing operation. Who should be involved in the DPIA? legal advisors or other experts, where relevant. the outcome of the DPIA and whether the processing can go ahead. You should record your DPO’s advice on the DPIA. If you don’t follow their advice, you should record your reasons and ensure you can justify your decision. DPOs must also monitor the ongoing performance of the DPIA, including how well you have implemented your planned actions to address the risks. DPOs have specific tasks around DPIAs, under Article 39 of GDPR. For this reason, you must ensure that any responsibilities you give to a DPO for your DPIA do not conflict with their ability to complete these tasks in an independent manner, as required by recital 97. Read our guidance on data protection officers for more detail on the tasks for DPOs in relation to DPIAs. Ask your DPO for advice. If you have any major project which involves the use of personal data it is good practice to carry out a DPIA. If you already intend to do a DPIA, go straight to step 2. Otherwise, you need to check whether your processing is on the list of types of processing which automatically require a DPIA. If not, you need to screen for other factors which might indicate that it is a type of processing which is likely to result in high risk. You can use or adapt our checklists to help you carry out this screening exercise. You can also read ‘When do we need to do a DPIA?’ for more guidance. If you are in any doubt, we strongly recommend you do a DPIA. Describe how and why you plan to use the personal data. Your description must include “the nature, scope, context and purposes of the processing”. in due course, whether you comply with any GDPR codes of conduct (once any have been approved under Article 40) or GDPR certification schemes. Whether you have considered and complied with relevant codes of practice. the expected benefits for you or for society as a whole. You should seek the views of individuals (or their representatives) unless there is a good reason not to. In most cases it should be possible to consult individuals in some form. However, if you decide that it is not appropriate to consult individuals then you should record this decision as part of your DPIA, with a clear explanation. For example, you might be able to demonstrate that consultation would compromise commercial confidentiality, undermine security, or be disproportionate or impracticable. If the DPIA covers the processing of personal data of existing contacts (for example, existing customers or employees), you should design a consultation process to seek the views of those particular individuals, or their representatives. If the DPIA covers a plan to collect the personal data of individuals you have not yet identified, you may need to carry out a more general public consultation process, or targeted research. This could take the form of carrying out market research with a certain demographic or contacting relevant campaign or consumer groups for their views. If your DPIA decision is at odds with the views of individuals, you need to document your reasons for disregarding their views. Step 4: Do we need to consult anyone else? If you use a data processor, you may need to ask them for information and assistance. Your contracts with processors should require them to assist. You should consult all relevant internal stakeholders, in particular anyone with responsibility for information security. We also recommend you consider seeking legal advice or advice from other independent experts such as IT experts, sociologists or ethicists where appropriate. However, there are no specific requirements to do so. In some circumstances you might also need to consult the ICO once you have completed your DPIA. See the next section of this guidance for more information. Step 5: How do we assess necessity and proportionality? Step 6: How do we identify and assess risks? You should include an assessment of the security risks, including sources of risk and the potential impact of each type of breach (including illegitimate access to, modification of or loss of personal data). To assess whether the risk is a high risk, you need to consider both the likelihood and severity of the possible harm. Harm does not have to be inevitable to qualify as a risk or a high risk. It must be more than remote, but any significant possibility of very serious harm may still be enough to qualify as a high risk. Equally, a high probability of widespread but more minor harm might still count as high risk. You must make an ‘objective assessment’ of the risks. 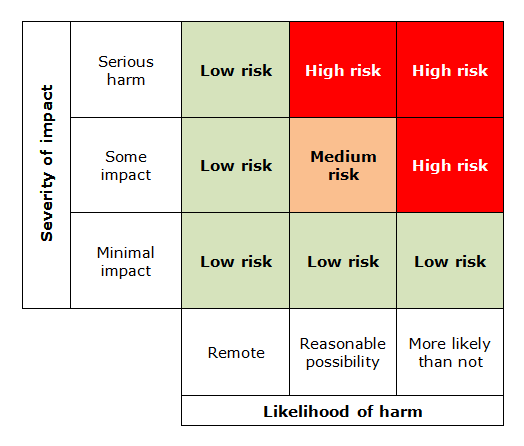 You might find it helpful to use a structured matrix to think about likelihood and severity of risks. The above matrix is an example of a structured approach to looking at risk. Your organisation may use a different method that you can adapt for the same purpose. You might also want to consider your own corporate risks, such as the impact of regulatory action, reputational damage or loss of public trust. Step 7: How do we identify mitigating measures? implementing new systems to help individuals to exercise their rights. This is not an exhaustive list, and you may be able to devise other ways to help reduce or avoid the risks. You should ask your DPO for advice. Record whether the measure would reduce or eliminate the risk. You can take into account the costs and benefits of each measure when deciding whether or not they are appropriate. Step 8: How do we conclude our DPIA? whether you need to consult the ICO. You do not always have to eliminate every risk. You may decide that some risks, and even a high risk, are acceptable given the benefits of the processing and the difficulties of mitigation. However, if there is still a high risk, you need to consult the ICO before you can go ahead with the processing. As part of the sign-off process, you should ask your DPO to advise on whether the processing is compliant and can go ahead. If you decide not to follow their advice, you need to record your reasons. You should also record any reasons for going against the views of individuals or other consultees. You must integrate the outcomes of your DPIA back into your project plans. You should identify any action points and who is responsible for implementing them. You can use the usual project management process to ensure these are followed through. You should monitor the ongoing performance of the DPIA. You may need to cycle through the process again before your plans are finalised. If you have decided to accept a high risk, either because it is not possible to mitigate or because the costs of mitigation are too high, you need to consult the ICO before you can go ahead with the processing. See the next section for more information on this consultation process. It is good practice to publish your DPIA to aid transparency and accountability. This could help foster trust in your processing activities, and improve individuals’ ability to exercise their rights. If you are concerned that publication might reveal commercially sensitive information, undermine security or cause other risks, you should consider whether you can redact (black out) or remove sensitive details, or publish a summary. Public authorities need to consider their freedom of information obligations, as privacy impact assessments are included in the definition documents for publication schemes for many public authorities. You need to keep your DPIA under review, and you may need to repeat it if there is a substantial change to the nature, scope, context or purposes of your processing. If you have carried out a DPIA that identifies a high risk, and you cannot take any measures to reduce this risk, you need to consult the ICO. You cannot go ahead with the processing until you have done so. The focus is on the ‘residual risk’ after any mitigating measures have been taken. If your DPIA identified a high risk, but you have taken measures to reduce this risk so that it is no longer a high risk, you do not need to consult the ICO. any other information we ask for. When we receive your DPIA, we will check that we have all of the information we need. We will also conduct a brief screening exercise to check that your DPIA does identify a high risk that has not been mitigated. If there is no residual high risk, we will let you know that we don’t need to review the DPIA. You should expect to be notified if your DPIA has been accepted for consultation within ten days of sending it to us. risks have been reduced to an acceptable level. In most cases we will aim to get back to you within eight weeks. In complex cases we may extend this to a maximum of 14 weeks. If we need to extend the deadline, we will tell you within one month of the date you submitted your DPIA and explain our reasons. If we need to ask for additional information, the clock will stop until you provide the requested details. In certain circumstances, where your intended processing operation would impact on data subjects in EU member states, we may be required to co-operate with other data protection authorities before providing our written advice, in accordance with chapter VII GDPR. Where this occurs it may mean that your case cannot be resolved in 14 weeks. We will notify you if this occurs and keep you updated. the processing would not comply with the GDPR and you should not proceed. In some cases, we may take more formal action. This might include an official warning not to proceed, or potentially imposing a limitation or ban on processing. In some cases, our draft decisions could be considered by other European data protection authorities where the scope of your intended processing includes European member states. If you disagree with our advice you can ask us to review our decision. If you want to appeal against any formal action we may take, you should first ask us to review our decision. If you are still not happy, you can appeal to the First Tier Tribunal in certain cases. The following list provides some practical examples of the types of processing operations which would require a DPIA under the list we are required to develop under Article 35(4) of the GDPR. This has been developed to help controllers better understand when a DPIA is automatically required, or when would be considered good practice. It should be borne in mind that any list of this type cannot be definitive. For more information read the ‘When do we need to do a DPIA?’ part of this guide.